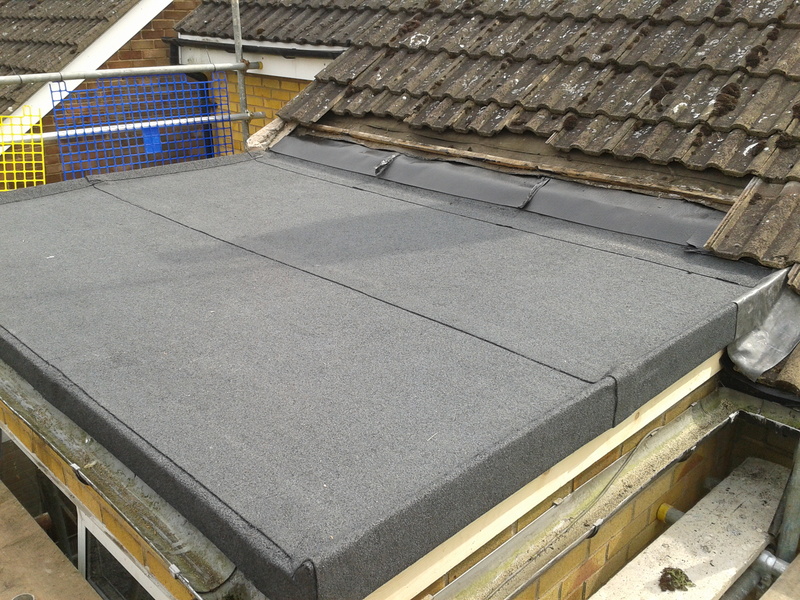 A built up felt roof is an established method of weather proofing roofs, normally flat roofs, by using more than one layer of bituminous roofing felt which is bonded to the previous layer. Felt is what keeps the rain out; it comes in rolls of 1 metre wide and in various lengths from 8 meters up to 20 metres depending on the type and manufacturer. Modern felts generally use either a glass fibre mat or for more high performance polyester mats. The finished surfaces are either made of sand or slate granules for a mineral finish. Mineral finishes come in a variety of colours, usually green, blue/grey, red/brown or white. These colours, other than green are only available on the high performance felts. The main advantage of High Performance felt is it’s life span. Any well designed, well carried out felted roof should last roughly about 15 years. But for an extra quarter of the price, the same roof with High Performance felt should last twice as long! (roughly 30 years). On that basis, the actual cost per year during the life of the roof will be greatly reduced.